When I scouted the area the day before, I couldn't find a dominant tree, but I could tell from the walk sign (and the scrapes, of course) that deer were in the area. I have to admit that without a dominant tree, I was less than optimistic about our chances (I gave it a three on a scale of one to ten), but it was the best looking spot I could find in a couple hours of quick scouting. I've got to give credit where credit is due and Ted's got a big ol' IOU from me. He suggested that we try rattling. I've never had ANY luck rattling, and had pretty much written off the idea, but he convinced me to try again. Boy am I glad we did. According to Ted, the secret is to start with a 140-class set of rattling horns - just kidding, but they're impressive aren't they. The rattling sequence in the video is the real deal. It wasn't re-created after the shot. I used a doe can call a couple times during short breaks in Ted's rattling. According to Ted, the real secret is in grinding the antlers together gently to simulate sparring, not crashing them together violently like some kind of prize fight. As you can see from the video, it worked like a charm. The deer ended up being just two and a half years old and weighing 125 pounds field dressed. I haven't measured him yet, but will update the post when I do. (Update - he grossed 128 and netted 122 5/8) He has the most antler mass of any two and a half year old deer that I've seen. He certainly caused a stir at the checking station where my buddy Doug Markham with the TWRA was on hand to check him in and take the photo above. For the record, I'm not a fan of "buck in the truck" photos, but there was this good lookin' fella hanging around who offered to pose with the deer, so I'm making an exception. Actually, Doug said he'd write me a ticket for some unspecified violation if I didn't use his photo. Speaking of Doug, Ted and I will be on his radio show on Saturday the 15th of November to talk about deer hunting, dominant trees, and probably ex-mothers in law too. Tune in to 99.7 WTN in Nashville from 5:00 a.m. to 7 a.m. to listen in. 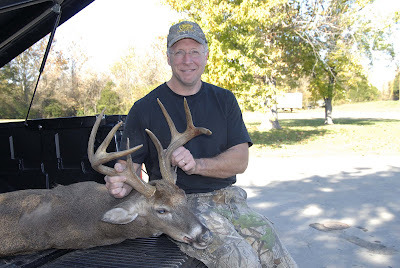 Have you had much success using deer calls or scent lures to bring deer into your stand? If yes, which call and / or lure was most effective? Thanks. Jeff - I have had limited success with rattling. Seems like the timing and buck/doe ratio have to be just right. I'd say my success ratio is in the 5% - 10% range for rattling. I'll occasionally use a grunt call and/or an estrous doe can call if I can see a deer that is out of range or behind cover. I don't generally blind call. I don't really have a preference as far as brands go. My programmer is trying to convince me to move to .net from PHP. I have always disliked the idea because of the costs. But he’s tryiong none the less. I’ve been using Movable-type on a number of websites for about a year and am worried about switching to another platform. I have heard very good things about blogengine.net. Is there a way I can transfer all my wordpress posts into it? Any help would be really appreciated!